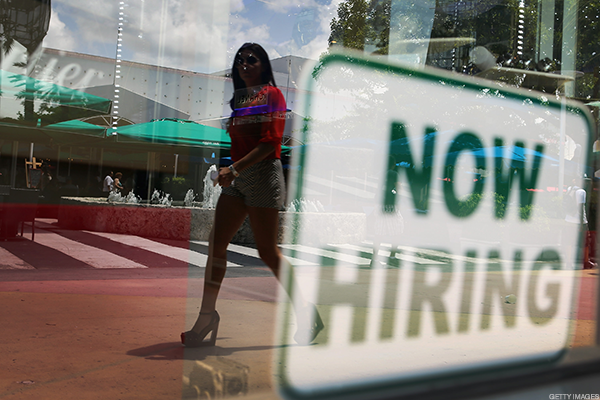 When will hiring gains start to yield bigger paychecks? The Federal Reserve wants to know. When the sports agent played by Tom Cruise asked football player Cuba Gooding Jr. what it would take to keep him as a client in the 1996 film "Jerry Maguire," the answer was simple: "Show me the money." More than two decades later, after a slow recovery from the 2008 recession that has yet to boost wages significantly, it's a sentiment that still resonates in the U.S. workforce, making income growth one of the most important indicators in the U.S. Labor Department's monthly employment report on Friday, Aug. 4. Indeed, while the current jobless rate of 4.4% is less than half its 2009 peak, salaries are growing less than 3% from one year to the next and inflation -- a measure of U.S. economic growth -- has slowed 40 basis points this year to 1.5%. That's well behind the 2% the Federal Reserve says would indicate stable expansion and help justify continuing to boost interest rates. "The big story just comes down to how much slack there is in the labor market and what that means for wages," said Michelle Meyer, U.S. economist for Bank of America (BAC - Get Report) , who predicted expansion might slow to 2.4% from a year ago. The bank is forecasting a 0.3% pickup in average hourly pay from $26.25 in June, after gains of just 0.1% from April to May and 0.2% from May to June. "If you see 0.4% month-over-month, people will pay attention to that and feel pretty encouraged," Meyer said in a telephone interview. "On the other side, another soft wage growth number, 0.1% for example, would be a big disappointment." All told, "the likelihood of a market response to a weak number is bigger than a market response to a strong number at this point, she said. Boosting salaries has been a big concern for U.S. lawmakers, who queried Federal Reserve Chair Janet Yellen about it repeatedly during testimony in July, and Republican President Donald Trump, whose 2016 campaign benefited from supporting protectionist trade policies to bring jobs back to the U.S. Significant growth in hourly earnings last month is unlikely, said Meyer and Ryan Sweet, director of real-time economics at Moody's, because of the high numbers to which July's figures will be compared. "Wages have been the missing piece" of the recovery, Sweet noted in a telephone interview. "Given how tight the labor market is, you would expect much stronger wage growth at this point." The U.S. economy has added 194,000 jobs on average over the past three months, a trend that supports a decline in the jobless rate to the mid-3% range by next year. The data revisions that have marked recent monthly reports, however, may alter that significantly, according to Bankrate.com economic analyst Mark Hamrick. Still, any number higher than 100,000 is sufficient to keep up with growth in the working-age population, Sweet noted. A long-term shift by American buyers from bricks-and-mortar stores to online shopping has spurred massive job cuts in the retail industry, since digital merchants don't require the same levels of staffing. "Retail trade has averaged a loss of about 3,000 jobs a month over the past three months," Hamrick said. "Harder to measure is what's going on behind-the-scenes -- the shift of employment to areas in online sales, such as in fulfillment, warehousing and distribution."